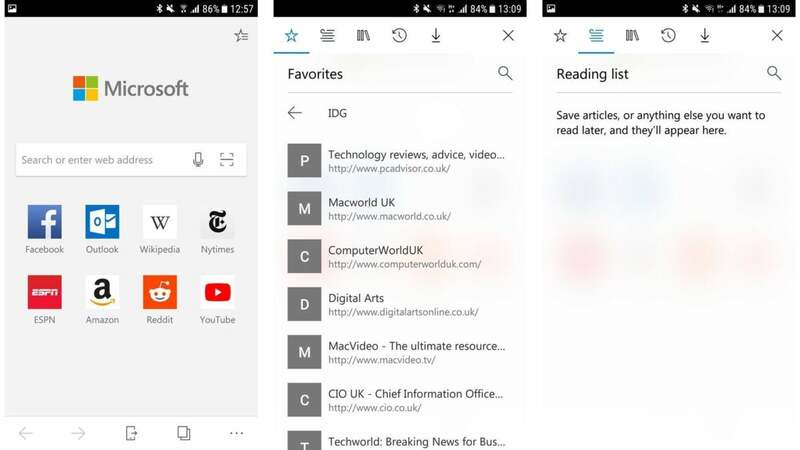 Microsoft's Edge browser was a welcome inclusion with Windows 10, bringing with it many interesting new features and an elegant user interface. Now Android users can get in on the action, as Edge comes to the world's most popular mobile platform. We show you how to get Edge on your Android phone, and why it's a good idea. If you're unfamiliar with the Microsoft's successor to Internet Explorer, then check out our How to use Edge browser in Windows 10 feature for more details. 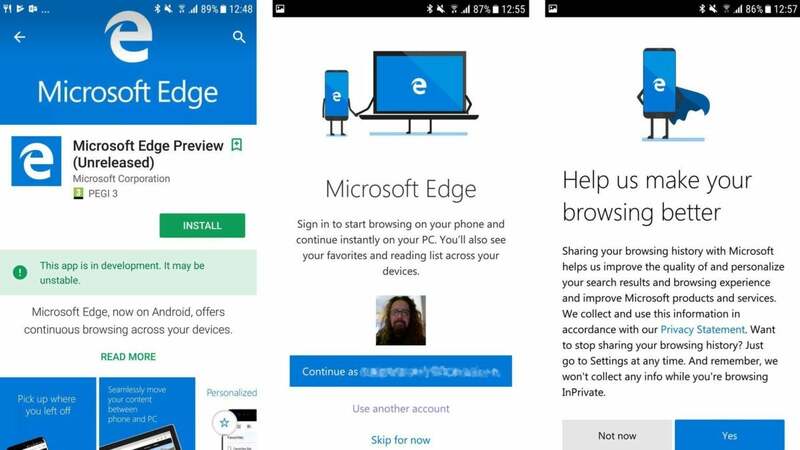 Microsoft has added an early-access version of its Edge browser to the Google Play store, which goes under the name Microsoft Edge Preview (Unreleased). This means you can download it now, but as it's still in the beta stage there will inevitably be a few bugs still to iron out. If you're happy to put up with the odd crash or erratic behaviour while Microsoft perfects the app, then tap the Install button and you'll be good to go in minutes. If, for any reason, you can't download the app from the Google Play Store, then there is another route you can try. 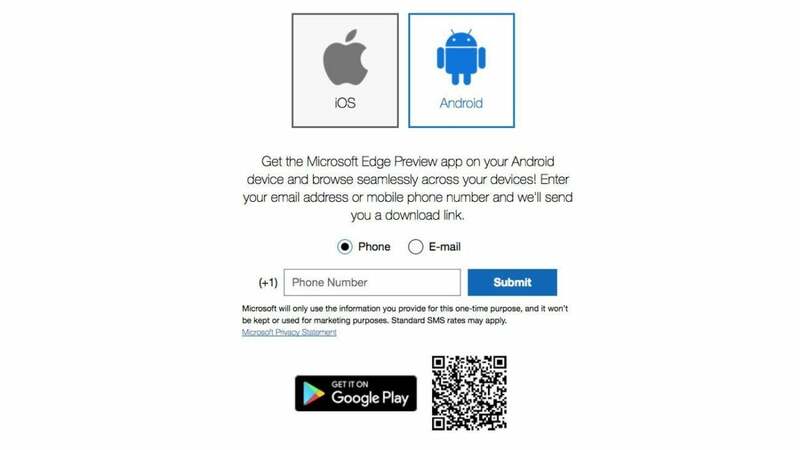 Here you'll find an option to select the Android version of the app, below which you can provide either a mobile number of email address to which Microsoft will send a link to the Edge preview. Alternatively, you can scan the QR code on the screen with your Android phone, which once again will take you to a download page for the app. Once the app is installed, open it and you'll be asked if you want to use your Microsoft account? Those who want Edge to sync with its counterpart on their Windows PC should say yes or choose the Continue as [your email] button. If you don't have a Microsoft account, or don't want to link it up yet, can either choose the Use another account option, or tap Skip for now. The next step will give you the choice to share your browsing history or not. This is obviously up to you. Sharing will improve suggestions that are presented to you by Edge, but it's by no means an essential feature. Once everything is set up you'll arrive at the Home page, which looks not hugely dissimilar to the classic Google variant. Enter a search into the main bar and you'll be whisked off to the far corners of the internet. Tapping the microphone icon allows voice search, while the square with a line running through it will open the built-in QR reader. There are a few other options worth knowing about, especially if you already use Edge on your Windows 10 PC. In the top right corner, you'll see a Star icon with three lines sticking out of its right side. Tap this and it opens up a new page with several icons across the top. From left to right they represent Favourites (bookmarks), Reading list, Books (a new feature arriving soon), History, and Downloads. Tapping the X on the far right will bring you back to the Home page. Along the bottom of the screen are a few more icons worthy of your attention. The three dots in the far right give you access to your account, settings, plus the ability to quickly open new standard tabs or private ones. Next to this is an icon with one rectangle on top of another. This shows you all of the tabs currently open in the browser, separating them into Standard and Private sections. The other main icon resembles a mobile phone with an arrow pointing out of its side. 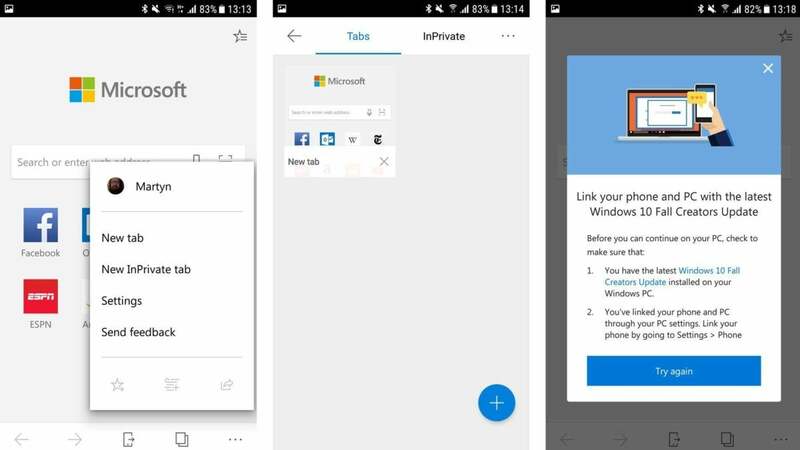 This is a clever new feature that allows users to link their Android phone and Windows 10 PC (so long as it's running the latest Fall Creators Update). When set up it will enable users to start reading a website article on one device, then send it to the other so they continue there instead. Expect the capabilities of this to grow over time, possibly into something special. It's looking good so far, and with Microsoft on form at the moment - just check out the excellent new Surface Book 2 for example - we think this is one to watch.